TOP bv from Wageningen is developing a technology platform that enables dairy farmers to sell bottled milk from individual cows. With the technology it’ll be possible to pasteurize and package bottles of milk from individual cows. Dutch consumers will soon be able to buy milk from their very own favorite cow. In the development of new products and processes, TOP always focusses on new business opportunities and models. According to the company, there are also interesting opportunities for innovative entrepreneurs in the dairy sector. In the last couple of years for example, TOP has been working with a group of dairy farmers to introduce safe raw milk onto the market. Today TOP introduces a new opportunity for entrepreneurial dairy farmers: the pasteurization and packaging of milk from single cows. Dairy farmer Matthijs Baan from Molenaarsgraaf will be the first to use the technology that TOP is currently developing. Baan: ‘’Every cow is unique, so every cow’s milk tastes different. One might be creamy and taste like ice cream, while other bottles might be very fresh or sweet.’’. 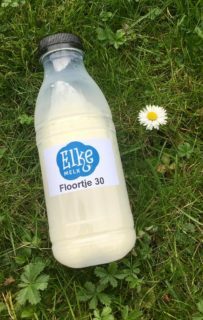 Supermarkets throughout the Netherlands will shortly have sweet milk from Clara 8 and creamy milk from Floortje 30 on their shelves. This is how TOP works together with dairy farmers on new initiatives to keep the dairy sector in the Netherlands healthy. For both projects it is the introduction of a new technology that facilitates dairy farmers to create new business models. Because of the impending nationwide launch and to protect her partners, TOP will not be able to share any more information about both projects in the coming months.